Microsoft is getting its fair share of hate, and even their recent policy change is causing a new wave of disapproval. This goes to show that gamers have a voice and apparently a strong one. Don Mattrick unfortunately has a voice too, and one that no one wants to hear. We know that Microsoft is not a dumb company or they wouldn’t have created such an outrage. So maybe it’s not Microsoft as a company that infuriates the consumers, maybe it is those they choose to speak for them. We already saw the backlash behind Adam Orth’s idiotic Twitter escapade and how that ended. When you decide to voice your opinion as an employee of a large company, you give the impression that the company you work for shares your opinion. It was only a matter of time before the higher-ups saw the controversial tweets Orth made, and how they immediately were met with negative attitudes. His [Orth] firing was all but inevitable. Then things got really interesting when the Xbox One was fully in the public eye (Enter Don Mattrick, stage right). I guess it’s safe to say that M$’s biggest problem isn’t its business decision, but more or less their choice of figureheads. 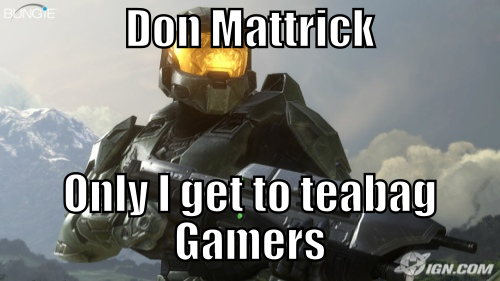 Lets just say the gaming community won’t vote Don Mattrick the man of the year. At the beginning of E3 Don helped perpetuate the message that Orth started. This crusade of an always-online gaming experience quickly became the bane of the industry. As soon as Don stepped onto the giant stage of E3, there was a mutual disdain from the majority of those in attendance. He went on to explain the vision Microsoft had for the future of gaming. However this vision was a forcible one. Don made it a point to express how their DRM policies favor the developers who make our favorite games. Only problem with it is he poured on the guilt to the consumers in his approach towards used games. Before the Microsoft presentation he [Mattrick] was interviewed by a journalist from Spike TV’s gametrailer.com. In this interview, without even being posed a question about what they offer the offline gamer, he made this comment; “Fortunately we have a product for people who aren’t able to get some sort of connectivity, it’s called the Xbox 360.” Way to alienate a good portion of gamers from entering the next generation of gaming with your product Don. Then it happened, our collective voices created what seemed to be a positive change. But how positive was it really? Well for Don Mattrick it wasn’t a positive change at all. Displeased with the reversal of the policies, he and the rest of the Microsoft gaming committee took it upon themselves to reverse the policies that gamers were actually pleased about. For instance the family share plan, which we now know wasn’t what we thought it was, but it was stricken from the features anyway. There is a level of spite that can be detected from Mad Hatter Mattrick that is clear enough to give the impression that he does not care about the average gamer. I am firmly convinced that Don and the CEO of Ambercrombie & Fitch, Mike Jeffries, are close friends. I say this because they both have similar approaches to their business model. While Ambercrombie doesn’t want fat or unattractive people in their clothes, it seems Mattrick does not want poor people or “unconnected” people using the Xbox One. To put the icing on the cake, Mattrick was in attendance when Spielberg and Lucas made their ludicrous remarks about gaming. How can you work for a company’s gaming division and not protect its honor. Do you think Iwata or Hirai would have sat idly by as those two discredited the unique experience that gaming offers? The painfully obvious fact is, Mattrick just likes having a job, and it just so happens to be in Microsoft’s gaming division. He shows no enthusiasm for gaming, or any sympathy for the consumer. This brings me to my overall point, and that point is that Don Mattrick will lose his job. He may not have coined #dealwithit, but he certainly didn’t jump to the rescue of gamers to wash away that sour taste it left in our mouths. Not to say Don will no longer work for Microsoft, but certainly their gaming division needs a new voice, one that truly understands this community. As stated earlier, Microsoft is not dumb, and they will soon see that it isn’t in their best interest to allow Don to keep flapping his gums. They would be much better off having him work in marketing for Windows, you know, since he loves connectivity so much. I personally already counted four nails that Don has put in his own coffin, and we all know that the Xbox One saga is just beginning. The holiday season will most assuredly mark the death of Don’s employment in Microsoft’s game division. I know I don’t stand alone when I say I will rejoice on that day to celebrate the fact we will no longer have to suffer that smug mouth piece at another E3.